Uttarakhand banned mining along Ganga over and again. Will it obey court order this time? Just a few days before Swami Nigamanand died while on a fast to protest state-sponsored sand mining and stone crushing along the Ganga near Haridwar, the Uttarakhand government ordered a ban on mining activities in the region considered sacred. Millions of pilgrims visit the place to take a dip in the Ganga during Kumbh Mela. But the ban came too late for the comatose ascetic and ecology of the river. The ban follows a directive of the High Court of Uttarakhand on May 26 which expressed concerns over the degradation of the river’s ecology and in area used for Kumbh celebrations. The court was hearing an appeal by Nigamanand, filed just before he began his fast on February 19, and his associates of Matri Sadan ashram in Haridwar. “The concerns raised by the social activists and surrounding population proved to be a wild goose chase as against the influence of the crusher owners…,” the court order read. Removing sand and gravel from the bank of the Ganga in the Kumbh area started in 1970, when the government of then undivided Uttar Pradesh notified five mining areas including a 74.2 hectares (ha) patch in Missarpur village and 32.4 ha in Ajeetpur village. In 2002, after the hilly region became a separate state, the government allotted the areas to the Garhwal Mandal Vikas Nigam, a state-owned development agency. But much before that, in 1997, Himalaya Stone Crusher Private Ltd (HSCPL), a leading sand products exporter in the country, had set up its crushing unit in the area. The company with its advanced excavators started mining sand and boulders from the river bed. Subsequently, a few private contractors also started mining sand illegally. “On a normal day you could see hundreds of tractors, trolleys and excavators on the riverbed,” says Shivanand Saraswati, head of Matri Sadan. “There is a nexus of politicians, administration and sand mining contractors. Several islands have disappeared in front of our eyes in the last 10 years.” The ashram is adjacent to mining areas in Missarpur and Ajeetpur. Enraged by the harm caused to the Ganga, the ashram started its agitation against mining. It launched its first protest in March 1998, in the midst of the Maha (great) Kumbh Mela, celebrated once in 12 years. Nigamanand, along with his associates, staged an indefinite fast demanding a ban on mining and crushing activities in the region. The government ordered a halt to all mining activities, but allowed it to resume soon after the festival was over. The ascetics continued their agitation. “Every time we sat on fast, mining stopped. But each time HSCPL’s influential owners got the mining resumed,” says Shivanand. HSCPL is owned by Bhumesh Kumar, son of Hazarilal Agarwal who is said to be an active member of Rashtriya Swayamsevak Sangh, an organisation closely associated with the state’s ruling Bharatiya Janata Party. In December 2009, a two-member committee of the Union environment ministry visited the site on the complaints of environmental activists. It found that mining was happening without any lease from the government or environment clearance from the Centre. But the ministry did not take any action against the errant miners. The issue became serious towards February 2010, the year of the Maha Kumbh Mela. With mounting protests, the state government again issued an order in December stopping mining and crushing activities in the area. HSCPL approached the high court. Judge Tarun Agarwal stayed the government order. Aggrieved by the order, Nigamanad started his fast unto death. The district administration forcefully picked him up from his ashram on April 27 and admitted him to the Haridwar district hospital. On May 2, the ascetic went into coma and the administration shifted him to a hospital in Dehradun where he breathed his last on June 13. 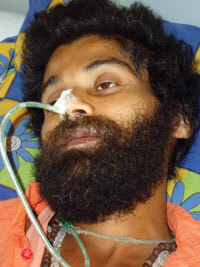 The Centre announced a CBI inquiry after his associates alleged that Nigamanand was poisoned in the district hospital. The state government’s apathy has already jeopardised the ecology of the region, which now faces severe soil erosion. “Our burial ground on the river bank in Ajeetpur got washed away in the past six-seven years,” says Atul Chauhan of Panjenheri, a village near the mining area. Removal of excessive sand from the Ganga results in pits on the riverbed and causes soil erosion in surrounding areas, he says. Groundwater in the region has also depleted in the past few years. Till five years ago, water level in the borewells was at a depth of 4.5 metres. Now the level has dipped to more than nine metres, Chauhan adds. This has reduced agricultural production in the region. Agrees Zafar Bharati, a resident of Sultanpur village. “The land is no more fertile. Only sugarcane survives here,” he says. Other farmers in the affected villages also say they have lost their fertile farmland on the river bank due to erosion. “Earlier there were dense forest areas on the islets in the river. With digging of sand, those have been washed away,” says Chandra Pal of Panjenheri. The impact of HSCPL’s crusher unit is not limited to Kumbh area. The mining area is also in close proximity to the Rajaji National Park. The residents of villages on its periphery complain disturbed by the noise of machines wild animals often enter the villages. for last 2- 3 decades World Bank, UNO and Government of India has announced fund and money for the cleaning of Holy Ganga river (Ganges).But these all efforts are useful only when we (People of India and Government) take responsibility to do efforts to save Ganga in our level. However, funds and money allotments are very political issues but, we should know that Ganga is related to our Religion, culture and great civilization of India. A large part of land erosion caused due to human activities like excavation, stone crushing, mining etc. Its time when we people of India and government should join hands to stop these kind of unauthorized mining activities. It's attack on our civilization and culture. save Ganga for our future, our children and Great Indian civilization. otherwise one day will come when Ganga, Kumbha, Holy dip, Tarpan all these term will be enlisted in our Myths. wishes for these sensitive story. Dear Prashant, Thanks! Yes, It has been a tragedy for Nigamanand and the Ganga both. Hope the central government, the national media and most importantly the people wake up now. We need the same moral attitude from entire media (the strongest medium to stop irregularity in society). This is not a easy task to write something concrete but you did it very well. Write something about the Baba Ramdev in Nigmanand comparison so that he (ramdev) can learn something with Swami Nigmanand. Can any one send me the copy of the notification/circular on the ban on mining activities of Stone and Sand in Dehradun and its sourrindings.